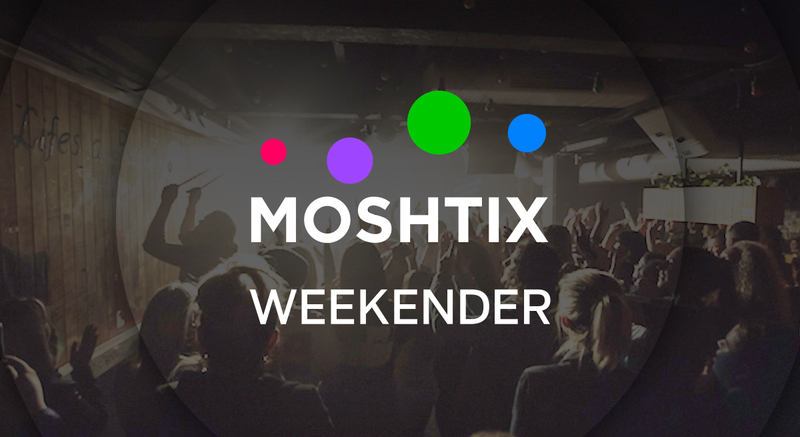 It's been a big week at Moshtix HQ with our new brand refresh and lots of new things in the pipeline. What better way to celebrate the changes than with a weekend chock-a-block with gigs goodies for all our fans! Tonight you can catch candid compositions and alluring harmonies from indie rock band, Tigers Jaw at Wollongong Youth Centre from 7 pm. This is an all ages event so for all you under 18 legends get down to this one! The band are also playing an 18+ show on Saturday at Oxford Art Factory for those who can't make it to tonights show. On Saturday our pals at Leadbelly are also hosting a killer performance by legendary Parisian artist Edith Piaf who will be delivering a spellbinding and romantic show in French and English. Score a rare chance to catch Pseudo Echo, the pioneers of electro-rock perform their international smash anthem Funky Town and more great hits tonight at The Toff In Town. If you're into day parties then you should hit up City Loop at RMIT's Alumni Courtyard. Catch performances by Andy Garvey, CC: Disco!, Cut Copy, Kllo, Mildlife and more. Festivities kick off from 1 pm! Slow things down on Sunday with oozy modular synths and effortlessly soothing vocals from Channel Tres at Howler. Explosive indie pop artist Mane will be showcasing her new single Save Yourself at Rocket Bar & Rooftop tonight and on Saturday indulge amongst the vineyards and gum trees at Lake Breeze Wines for Handpicked Festival. Check out performances by Boy & Bear, Broods, Vera Blue, Alex Lahey and more overlooking breathtaking views of regional South Australia. If Handpicked is a bit of a hike for you then head to Crown and Anchor Hotel to see Bakers Eddy play hard-hitting punk rock or for the electronic fans out there Fat Controller is hosting Luen, one of Australia's biggest rising stars in the house and techno scenes. Head to Woolly Mammoth on Saturday and catch Pop maverick E^ST (Mel Bester) perform live as part of her "Life Ain't Always Roses' EP tour. Triple J's very own Tom Tilley is playing a DJ set filled with disco and house bangers on Saturday at Tapas Lounge Bar in Devonport. If you like to boogie this one's definitely for you! Catch Zimbabwean born, Melbourne soul singer Thando at MR Wolf on Saturday night or head to The Basement for an epic 90's Music Festival featuring 12 bands playing tribute to 12 of the big names in 90's music.